Minister of Water, Land, Environment and Climate Change, Hon. Robert Pickersgill (second right); is joined by (from left), Mayor of Savanna-la-mar, Bertel Moore; Chairman of the NWC, Dr. Leary Myers; Councillor for the Leamington Division, Cebert McFarlane; Member of Parliament for Eastern Westmoreland, Hon. Luther Buchanan; and Chairman, Rural Water Supply Limited, John P White; as they break ground to mark the start of work for the rehabilitation of the water distribution system in Cedar Valley, Westmoreland, on Friday January 10. The Government has signed two contracts totaling $80 Million for the upgrading of the potable water distribution system in Eastern Westmoreland. More than 13,000 residents are expected to benefit from the improved water supply. Minister Pickersgill stated that there will be renewed commitment towards expanding and improving the potable water supply network across the island this year. The Government has signed two contracts totaling $80 Million and broken ground for the upgrading of the potable water distribution system in Eastern Westmoreland. One contract, valuing $42 million, was signed to cover work in the Leamington/Cedar Valley area, while the other, valued at approximately $38 million, will cover the Bethel Town/ Argyle Mountain area. More than 13,000 residents are expected to benefit from the improved water supply. Signatories to the contracts were Minister of Water, Land, Environment and Climate Change, Hon. Robert Pickersgill; Chairman of the National Water Commission (NWC), Dr. Leary Myers; Chairman, Rural Water Supply Ltd., John P White; Member of Parliament for Eastern Westmoreland, Hon. Luther Buchanan, and representatives from the Contractors, D R Foote Construction Company Ltd; and Bacchus Engineering Company Ltd. Addressing the contract signing ceremony in Cedar Valley, yesterday (November 10), Minister Pickersgill stated that there will be renewed commitment towards expanding and improving the potable water supply network across the island this year. Mr. Pickersgill informed that his ministry remains unswerving in its efforts to achieve universal coverage for potable water by the year 2030, noting that access to safe water supply has been one of the top priorities in developing countries over the last three to four decades. 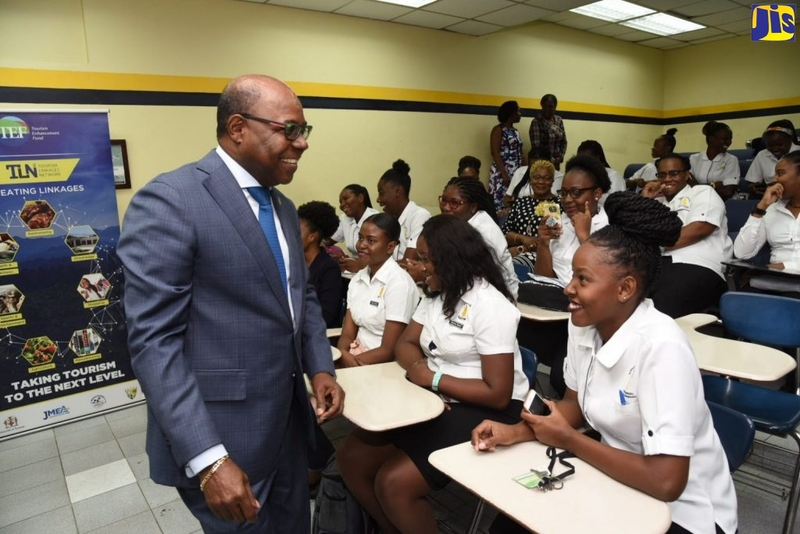 He reminded the audience that rainwater harvesting is one of the oldest and most effective means of ensuring a steady water supply especially in drought plagued areas, noting that this was commonplace across rural Jamaica in the not too distant past. The Minister further added that the government is now strengthening the policy which requires that persons, who are undertaking development, provide their own domestic water where there is no connection to the central water system. “This policy is now being strengthened to make it mandatory for all developments to make allowances for rainwater harvesting, either above or below ground, whether they are connected to the central water system or not,” he emphasised. “I firmly believe that this is the route we must take in order to ensure our water security, particularly in the face of climate change impacts,” he stated. The Minister outlined the costs incurred by the NWC in collecting, storing, treating and distributing water, and encouraged those receiving the commodity to be reasonable and pay their bills. The scope of work on both projects include the rehabilitation of existing water distribution network in the area and the installation of some 4.5 kilometres of new pipelines.